The DinoFamily really have to count our lucky stars because we have been very lucky, not only we managed to enroll DinoBoy into a good neighbourhood child care centre that are easy on our pockets, we managed to enroll him into a good student care too. Plus he's got some good and passionate teachers with the children's interest at heart teaching him in both places. Then I received a letter that they will bring the students out for an excursion to not one but two places! Now, this takes away a little bit of the guilt feelings I had recently for not able to take leave to go out to spend some fun time with DinoBoy this June holiday. I now know that he will not lose out in the FUN part, and what best way to have fun with your fellow school mates? Besides that they are also doing some academic learning, crafting and character building during the school holiday too, so its not all play and no work. This mama can relax and not worry that DinoBoy will play too hard and forgot about school comes July 2013. Truth to be told, my initial understanding about student care is that the child will stay in the centre after school till 7pm. The centre's teachers will supervise the students to ensure that school work are done, a little bit of play time either indoor or out door. Then I realized that this student care centre has their own academic curriculum, and later I was glad that they drill the students with passed years test papers from other schools for their school's tests/exams. 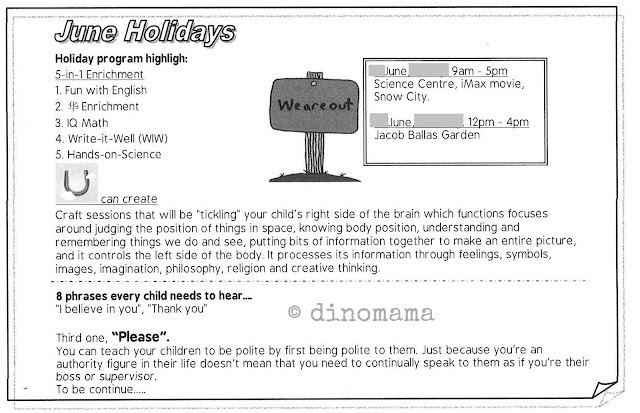 Thus for lazy full time working mums like me I can just sit back and relax a little bit while trusting the student care teachers to "take care" of DinoBoy's school work. Of course I have to play my part too and refrain from being overly reliant on them to do the job. 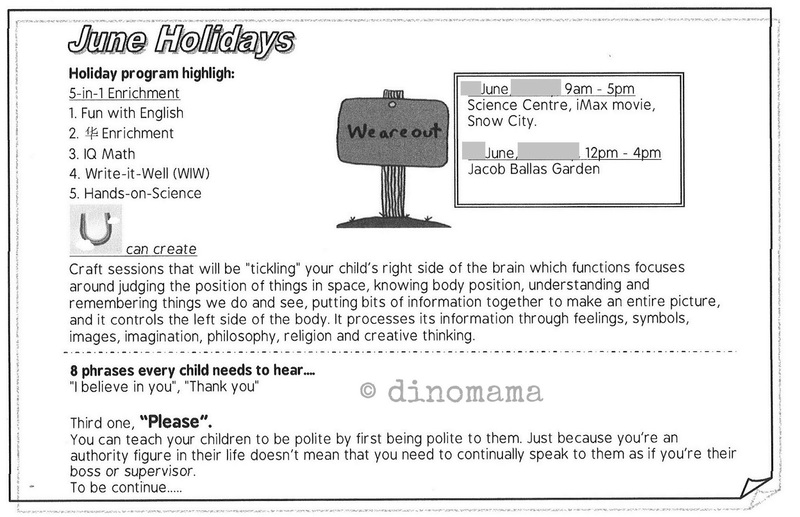 So, while DinoBoy will be having some fun at his student care centre this June holiday, what will you be doing with your kids?